Secure Style offer a broad range of attractive and durable canopies suitable for various applications. Our canopies are made from Glass Reinforced Plastic (GRP) and are extremely strong and robust whilst offering elegance and functionality. Ideally suited to go above both front or back doors these practical products will keep you dry while you hunt for your keys or provide a charming finish to bow or bay windows. Window canopies are not simply ornamental however. They will provide shade to the interior of your home on hot days and can help prevent sun-bleaching of soft furnishings and curtains. Our canopies are simple and quick to install yet will last you for many years. What’s more, they are completely maintenance free. 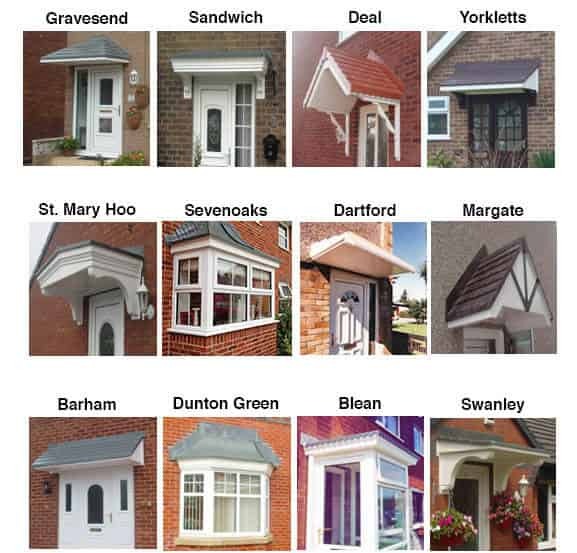 Our highly skilled fitters have installed many canopies throughout Kent and surrounding areas for our happy customers and are usually able to complete installation within two to three weeks from our initial technical survey. If you are interested in a canopy for your home please contact us on 01227 779 372 and speak with an advisor today. Alternatively, you can get in touch online and we will get back to you as quickly as possible.